Meet Ariel!! She's a super sweet Hardin Valley High School 2017 senior. I had the absolute pleasure of taking her AMAZING Knoxville senior pictures last month. She's beautiful inside and out, and full of great ideas! She's a budding photographer herself, so it was an honor to be chosen to take her senior portraits. Ariel's first choice of location was downtown Knoxville for an urban feel to her portraits. It was such fun exploring down there with her and her Mom! She knew of some great spots, combined with a few of my favorites, these pictures are to die for! Even though it was 95 degrees out in Knoxville that day, you'd never know by looking at Ariel's pictures! These yellow doors were one of her find. Aren't they perfect?? Her red Converse were the perfect fit for this downtown Knoxville spot, they really pop! Our second spot was a gorgeous, grassy field in Maryville during my favorite time of day, golden hour. It gives the images a soft, golden glow that is just perfect! Ariel brought along this awesome chair, isn't it cool? I may need one for myself as a prop! The meadow made for a beautiful backdrop for this portion of the session, I had such a hard time choosing images because there were so many awesome ones. We ended our session on the most adorable white boardwalk. Ariel looks like a movie star! She totally reminds me of Taylor Swift; just gorgous! Say hello to Morgan! She's a super sweet 2016 Knoxville senior with some big ideas! 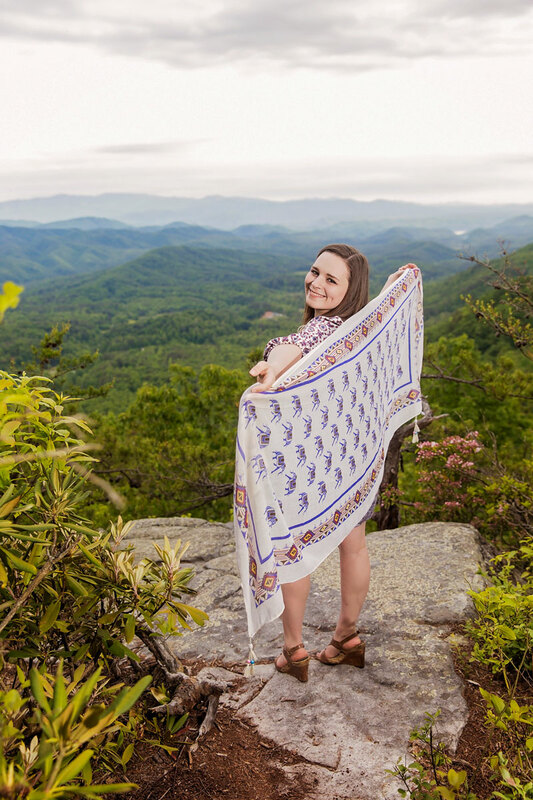 She had such great ideas for her Smoky Mountain senior portraits! Morgan was amazing and even brought super cute props, I couldn't have chosen them better myself! We ended up using a beautiful location overlooking the Smoky Mountains, and boy were her and her mom troopers on the hike up, in heels no less! Morgan found this darling vintage suitcase at an antique store in Knoxville. We got some fabulous pictures with it! Oh the places she'll go next year and beyond! The suitcase also appeared in this cute Pinterest inspired pose that Morgan suggested. She rocked her heels and tassel! Pinterest in a gold-mine for photography inspiration, and Morgan found a pose there with a scarf she fell in love with. I re-created it with my own spin with the gorgeous Smoky Mountains in the background. It's such a whimsical senior portrait. A stack of books is PERFECT for a Knoxville senior portrait, it represents all the hardwork you've put in over the last four years. These vintage books were a great touch for Morgan's session. Of course we had to include cap and gown pictures! No Knoxville senior session is complete without them!